Laguna College of Art and Design students will join California artist Elizabeth Turk in co-curating and installing “The Shoreline Project” at LCAD Gallery, 374 Ocean Avenue, opening Nov. 1. An artist’s reception with Turk will take place at 4 p.m. Thursday, Nov. 1. 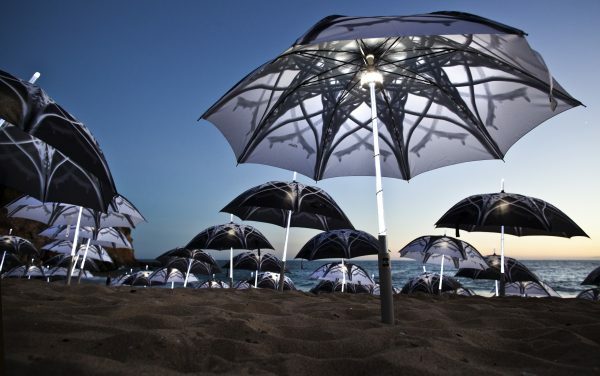 The exhibition will reveal Turk’s extensive creative process that lead up to the Shoreline Project, a public performance of 1,000 volunteers holding LED-illuminated umbrellas. The performers will converge at sunset Saturday, Nov. 3, at Main Beach. Spectators are welcome to watch and experience the event. Laguna Art Museum’s ‘Art & Nature’ series will continue at 7 p.m. on Friday, Nov. 2. Jane Munro will give the Art & Nature keynote lecture, “Charles Darwin: Art, Nature and Beauty,” at the museum. Munro is keeper of paintings, drawings and prints and acting assistant director of collections at the Fitzwilliam Museum at the University of Cambridge. Her lecture follows a 6 p.m. reception. Advance tickets are recommended and available at: lagunaartmuseum.org. On Saturday, two events precede “Shoreline Project.” At 11 a.m. the just-released film, “Leaning into the Wind” follows sculptor and environmentalist, Andy Goldsworthy, exploring how his life experiences have impacted his art. At 2:30 p.m. Jane Munro, along with UCSD evolutionary biologist Lin Chao, and artist and UCLA professor Victoria Vesna, discuss art and nature in a conversation moderated by Warner. Advance tickets are recommended. The festivities wrap up on Sunday, when the museum opens its doors for free at 2 p.m. to visitors of all ages, offering a variety of interactive art, nature, and science activities, environmental information, and face painting.